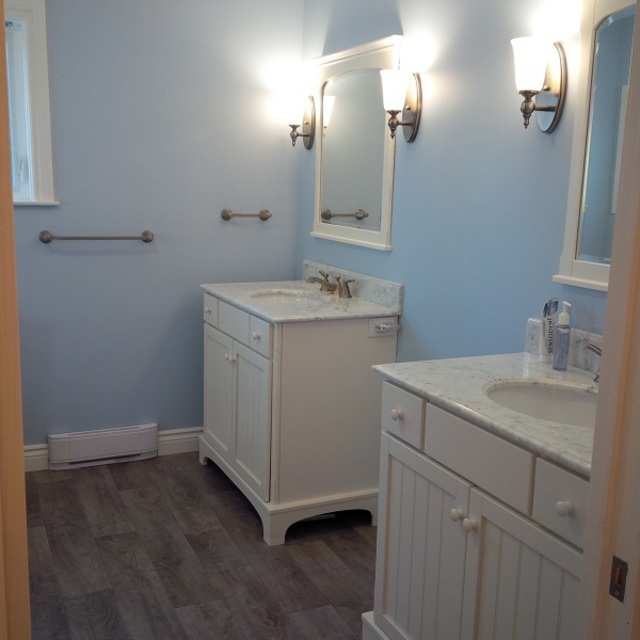 Thank you to Jim for taking my vision and making it a reality for both my on-suite and upstairs bathrooms plus changes to a bedroom. He heard the ask, kept in budget, on time and provided a fabulous end product. During the renovations the mess was kept to a minimum and they tried to minimize any inconvenience to day to day living. Looking forward to my next project working with team. Thank you for this fantastic review Jeanette! We always give our best effort to make each renovation experience a positive one. Your planning and quick decision making played no small part in the successful completion of your renovation. Thank you again for the kind words. Thank you for this fantastic review Myrna. This renovation was one of my favourites with challenges around every corner and a very dramatic change to the layout of the home. Thank you for being so well prepared. It's always a pleasure to work for such nice people. ROI Reno's removed a load bearing wall from our kitchen into dining room in order to make our kitchen larger. They also installed new tile in our front and side entrance and in our kitchen. Their workmanship is amazing, could not be happier with how everything turned out. I would highly recommend for any project small or large! Thanks for this fantastic review Matt. Your planning and preparation played no small part in the successful completion of your renovation. Thank you again for trusting us with your new home. Thank you so much for this fantastic review. It is so nice to have such great clients. Your planning and preparation played no small part in the successful completion of this project. This Reno was lots of fun and challenging. We are so glad you are happy with he result. Thank you again for the great review. Jim and Jim renovated and updated our basement over the course of two months and we could not be more pleased with the final product. They were always respectful of our property and a pleasure to have in our home. We knew we were in good hands with Jim and Jim and had the utmost confidence that the work was being done properly and to the highest standard. We will definitely recommend them to friends and family and they will be our first call for any other home renovation projects we need done. Thank you for this fantastic review. It was indeed a pleasure to work for such a charming family. I hope you get as much enjoyment out of your renewed living space as we did working on it. Thanks again. R.O.I. Renos Jim and Jim did a terrific job renovating our basement Absolutely top-notch in quality of workmanship, cleanliness,They are so professional and detailed. Their work is precise. couldn't imagine a better experience.would highly recommend R.O.I RENOS to Anyone who's looking for quality work! We could not be more pleased with Jim and Jim's efforts. Thank you so much for this fantastic review. I hope the renovations we did provide you with enjoyment for years to come. Thanks again. Thank you very much for this incredible testimonial. It's the little things in our home which make it our own. It was our pleasure to help you enjoy your kitchen just that little bit more. Thank you again. Bathroom renovation and change of doors in half of the house. It was a pleasure to do business with these gentlemen. They came highly recommended by family members and lived up to the rave reviews. The finished product is excellent and they were very collaborative and respectful of our needs. Both the JIMS were very professional and calm and this made for a comfortable presence in the house. Plus the dog thinks they're GRReat! Respecting a persons home is our top priority and that includes their pets. Thank you for this marvelous review. It was our pleasure to work for you. On a recommendation from our daughter (Jim had renovated a bathroom doing an exemplary job) we hired him to rebuild two sets of outdoor stairs and to secure a new handrail on our basement stairs. We have lived in our home for 35 years and what was acceptable when you're in your forties is not when you're in your seventies or eighties. Jim was both courteous and efficient. He came and went on his own and we scarcely knew he was there. He completed the work in a timely manner exceeding our expectations and left the work areas tidy. 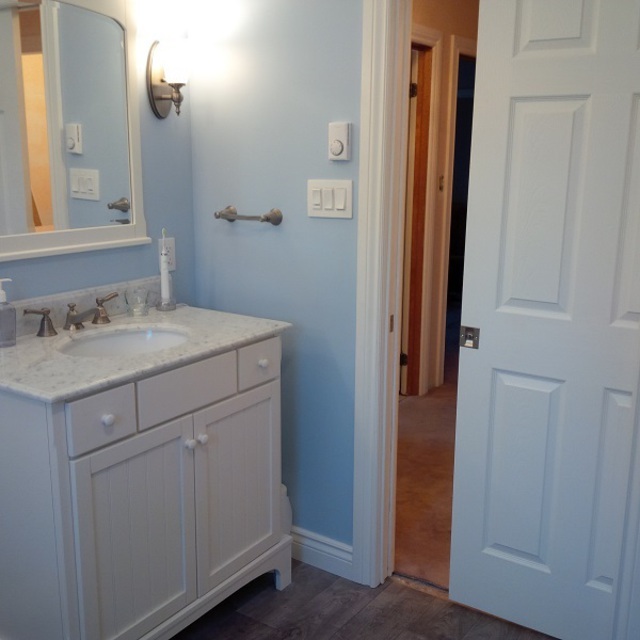 We would not hesitate to recommend ROI RENOS to anyone requiring renovations or construction work. Thank you very much Peggy and Murray, for this great review. It was our pleasure to fix those concerns for you and help you feel comfortable in your home. Obviously one less thing for you to worry about. You are great clients and very friendly couple. I will also be in touch with your daughter to thank her for the referral. Thank you again. Kitchen Reno and Window Framing. ROI Renovations was absolutely outstanding. They have completed two jobs for us recently, all work was outstanding, they were on time, cleanly and fairly priced. We have already started planning our next renovation and ROI contracting will be heading up that project as well. Thank you for this glowing review. A very friendly and hard working family that can appreciate quality workmanship. We look forward to working with you on your next project. Thank you so much for starting our new year with a marvelous testimonial. ROI Renos is a home renovation company that specializes in interior renovations or restoration. Professional service and top quality materials ensure that your project will be completed on time, on budget and will be done right. It is what you deserve. We pride ourselves on meeting and exceeding our clients expectations and developing relationships that promote trust and confidence. 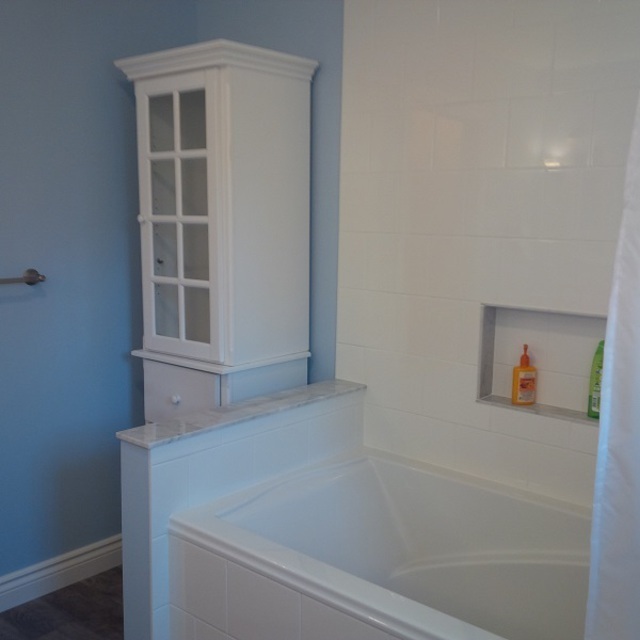 Basement, Kitchen and Bathroom Renovations to homes of any age. Professional service and quality materials.